The square footage of your home plays a big role in your home value. Homebuyers like to see that a house has enough space for them and then some. This allows them a chance to grow, to entertain, or simply to spread out comfortably throughout the home. If your home is a little cramped, adding a sunroom doesn’t just add light and aesthetic; it adds square footage that can be used in whatever way best suits the homeowner. So if you sell your home a few years down the road, what potential buyers will see when they look at your sunroom is potential. If you see appeal in living in a home with a sunroom, chances are potential buyers will also see that appeal. With natural sunlight flooding the room and a warm, airy atmosphere, it’s just a pleasant space that they can use in any number of ways. Maybe they want to set up a breakfast nook in the sunroom, or create a playroom for the kids. Maybe they’ll enjoy the sunroom for the simple virtue of being able to drink in the sunlight in the morning or enjoy extended outdoor views without having to go outside. Whatever the reason may be, a home with a sunroom is often seen as more desirable to buyers, which gives you room to list the price a little higher. Who needs electrical lighting in a sunroom that floods the space in natural light? 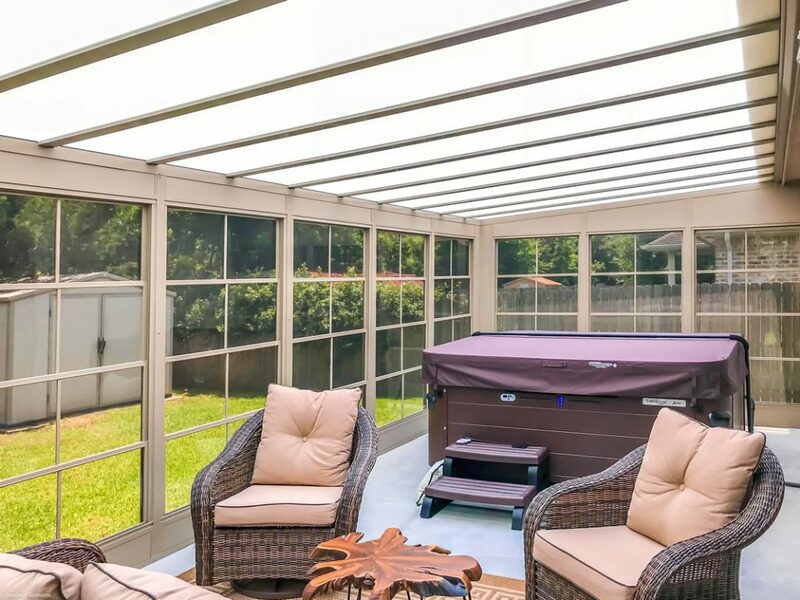 And when you choose the right sunroom model, like the Model 400 All-Season Thermal Room, your sunroom can stay comfortable and insulated year round without having to rely on your home’s heating and cooling system. This will help you save money on your energy bills while you live in your home, but it will also appeal to potential buyers years down the road. The more energy efficient a home is, the higher the value. Most room additions will add value to your home, but room additions can be pricey and time consuming. Fortunately, sunrooms are fairly easy to convert. You can turn an old room into a sunroom by changing the walls to windows and screens. You can even build a sun space around a porch to create a sunny, convenient porch enclosure. With less hassle of installation and cost than a traditional room addition from scratch, you’ll be better able to get an ROI when you eventually decide to put the house on the market. Want to add value to your home this year with a bright, beautiful sunroom? Contact Sunspace Texas today for more information. FREE ESTIMATE Fill out the form for a FREE estimate. Sunspace of Texas is dedicated to creating spaces you can enjoy as additional living space for entertaining friends and family throughout the year. We specialize in WeatherMaster Window and Acrylic Patio systems. By providing outstanding customer service and quality workmanship we can offer your home or business style, elegance and functionality. We are committed to Enclosing Texas one Porch at a time!